Root cause identification of failing devices (e.g. field returns or new designs) is essential for all semiconductor manufacturers and design houses. Simultaneous use of probe cards and MicroPositioners (DUT driving & internal signal measurements), innovative state-of-the-art measurement technologies and even probing of very small signals inside temperature controlled (down to -60°C), light-tight and EMI-shielded test environment with TS2000-SE and TS200-SE, these are just a few examples of MPI offerings for a complete FA test solution. 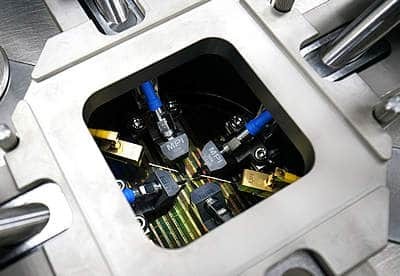 MPI Engineering Probe Systems are easily configured with emission microscopes such as from Hamamatsu Photonics Japan to detect and localize the IC failures. In addition, the TS150/TS200-HP probe systems are the ideal choice for the equivalent analysis of High Power devices up to 10 kV and 600 A.